But there are many ways in which you can get your novel service or product on to the market. At one end of the spectrum you could licence it to an existing supplier of similar services or products, at the other end you could think of establishing your own business to provide the service or manufacture and distribute the product. The route you choose to take will depend upon a myriad of variables many of which will be beyond your control. Identifying and developing the most appropriate commercialisation strategy for a specific invention is therefore critical to the success or failure of that novel product or service. Amongst many other things that you will need to understand when deciding your strategy will be the details of all relevant market places, your competitors existing and potential, the strength of your IPR, and most importantly the financial resources required to pursue your chosen strategy. The first step is always to make a detailed evaluation of the novelty of the invention to decide if there is worth pursuing. 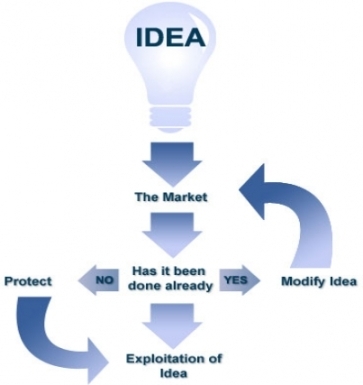 Once you are sure that its novel and you have decided how to protect your idea you enter the exploitation or commercialisation phase. 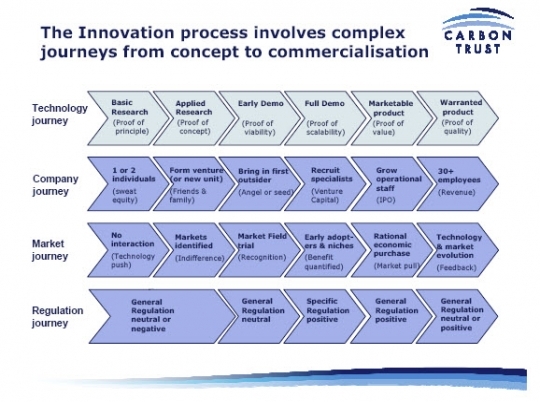 It is often described an innovation tunnel or innovation funnel but as the figure below from the Carbon Trust shows its much more of an innovation race with several tracks all running in parallel – especially if you choose to follow the entrepreneurial route and set up a new business. e-bbex and its associates have first hand experience of every step of the route from invention to market place. We are ideally placed to work with you and your patent agent/attorney to give you independent advice and guidance and to work with you to help you develop the most appropriate commercialisation strategy and then assist in the implementation of that strategy.